FORTALEZA: Klaas-Jan Huntelaar struck a stoppage-time penalty as the Netherlands staged an incredible late fightback to beat Mexico 2-1 and reach the World Cup quarter-finals here Sunday. Huntelaar kept his cool in furnace-like conditions to fire Holland into the last eight after Wesley Sneijder had scored an 88th-minute equaliser to cancel out Giovani Dos Santos's goal for Mexico. 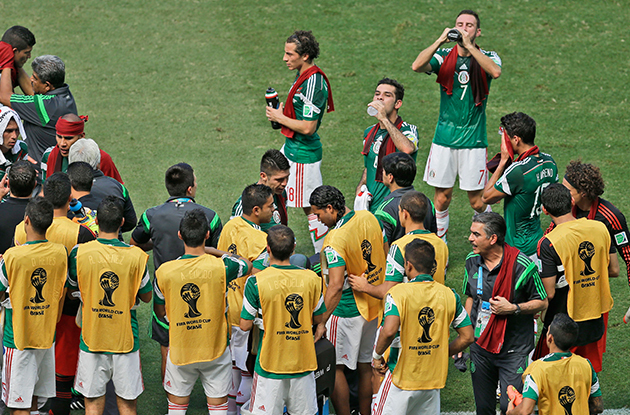 The dramatic Dutch fightback left Mexico's players in tears as their last 16 jinx struck again. The Netherlands had looked to be heading for defeat at the Castelao Stadium after a game played in ferocious heat. Dos Santos's long-range strike on 48 minutes looked like it would settle the encounter. But with time ticking down, Holland launched wave after wave of attacks. They were rewarded when Sneijder lashed in the equaliser with two minutes to go. Then in the dying minutes, Arjen Robben jinked into the penalty area, and when veteran defender Rafa Marquez stuck out a leg, the Bayern Munich star went over. Referee Pedro Proenca pointed to the spot and Huntelaar stepped up to bury a nerveless penalty past Guillermo Ochoa. The win puts the Netherlands into a last eight meeting with either Costa Rica or Greece in Salvador next Saturday. The Costa Ricans face Greece in their last 16 meeting later Sunday where the winner will reach the last eight for the first time. Costa Rica sensationally beat Italy and Uruguay and drew with England as they topped Group D. Georgios Samaras scored a penalty in the third minute of injury time to give Greece the points they needed in their last Group C game to get the second qualifying place at the expense of the Ivory Coast.